This Lent, encounter our neighbors in the Archdiocese of Chicago and share their stories of hope. The statistics say it all. Last year, the city of Chicago ended 2016 with 786 murders. This year, the number is already over 160 as of mid April. The community is struggling with violence and even the pope has noticed. Cupich has committed the Archdiocese to stepping up efforts to support anti-violence efforts. He has pledged to devote about $250,000 — half of his discretionary funds — to grassroots parish and neighborhood initiatives to reach young people and those affected by violence. Many parishes are already working to bring peace, healing and guidance to the communities they serve. 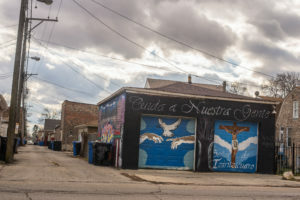 In Little Village, for example, a unique program at St. Agnes of Bohemia helps young people who are vulnerable to gang recruitment find a positive outlet. These teens use positive graffiti to create art that inspires and empowers. Their work has become a community movement that values equity and fairness. In the Back of the Yards neighborhood, Precious Blood Ministry of Reconciliation works with over 250 young people and over 70 families who have been affected by violence and incarceration. Mentoring and building relationships is its chief work. Father Dave Kelly, who works at Precious Blood, explains they create safe places where people can speak their truth. Precious Blood also offers opportunities for young people affected by violence to learn a skill and prepare for a job. A Catholic Relief Services (CRS) Rice Bowl grant partially funds the programs at St. Agnes and Precious Blood. CRS carries out the commitment of the Bishops of the United States to assist the poor and vulnerable here and overseas. CRS promotes human development around the world by responding to major emergencies, fighting disease and poverty, and nurturing peaceful and just societies. Peace and a culture of nonviolence, Pope Francis writes, are both needed and attainable in Chicago. In Chicago’s Back of the Yards neighborhoods, young people are building: They are physically constructing community gardens, picnic benches and tables, while also rebuilding communities and reviving lives. Precious Blood Ministry of Reconciliation leads this effort by working with youth and families affected by violence and incarceration, offering mentoring and nurturing healthy relationships. At Precious Blood, young people learn new skills and prepare for jobs like woodworking or gardening. A Catholic Relief Services (CRS) Rice Bowl grant partly funds these programs. CRS carries out the commitment of the Bishops of the United States to assist the poor and vulnerable here and overseas. In a world of refugees, hunger and drought, CRS still sees the good news and the strength of the human spirit every day. That boldness is alive and thriving in Chicago in kids like Raheem and Jovante. Raheem’s and Jovonte’s story is not unique to the United States. CRS works in many countries that struggle with gang violence and loss of opportunities for its younger population. A CRS-sponsored program called YouthBuild works to train people in business. Dave Kelly has spent the last 40 years in jail: It’s a choice he says has brought him grace and blessings. 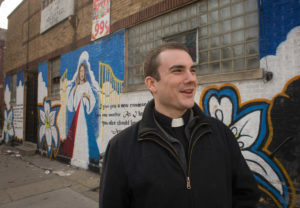 In addition to working with young people in Chicago’s jails and juvenile detention centers, Kelly heads Precious Blood Ministry of Reconciliation in Chicago’s Back of the Yards neighborhood. The organization works with 228 young people and 75 families who have been affected by violence and incarceration. Its chief work surrounds mentoring and building relationships. Participants are referred by word of mouth, other community stakeholders, schools and probation offices. The goal is to meet kids where they are. At Precious Blood, young people create art to tell their stories. Many participate in job readiness programs that can transition them into employment. For those not ready to enter the job market, there are other options. Kelly says there are opportunities for young people to learn new skills and prepare for jobs like woodworking, culinary arts or gardening. “Kids can discover career paths and talents, make a little bit of money and learn work ethics,” he adds. And for the kids who have already been in a juvenile center or jail, Kelly says they need one very important thing. “Someone to work alongside them and say, ‘Let’s do this. I’ll work with you. I’m committed to you,’” Kelly says. The biggest message at Precious Blood is one of reconciliation and healing. Kelly says peacebuilding starts with telling stories and getting to know who someone is on the inside. Peacemaking circles are common at Precious Blood. Over time, participants place their story in a sacred place and begin to repair relationships. One of the most common circles is for mothers who have lost children to homicide. These circles, Kelly says, are amazing to watch when you can see the healing happening. Kelly says he sees God every day in his work, whether at a peace circle or behind bars with an inmate. Kelly says Precious Blood is not alone in serving those imprisoned or touched by violence. Peacebuilding happens globally, and there are several organizations in other parts of Chicago. He calls the collaboration a game changer for those who are living with hurt in a world that sometimes feels like it is losing its humanity. “If we had many more organizations that are passionate about and really work with these families and young people, the kids would come out of jail with support and care to fulfill the dreams they had when they were in jail,” Kelly says. Activities like woodworking and the community gardens at Precious Blood Ministry of Reconciliation are partly funded by a Catholic Relief Services (CRS) Rice Bowl grant. CRS carries out the commitment of the Bishops of the United States to assist the poor and vulnerable here and overseas. St. Agnes of Bohemia Parish in Little Village is kind of a misnomer these days. Few living near the church are of Czech descent, as the name implies. In fact, a large Mexican immigrant population comprises the parish, which celebrates seven Spanish Masses on Sunday. Father Don Nevins, the pastor at St. Agnes, says in the 1980s and ’90s, Mexican immigrants flocked to the area, making the church one of the largest Catholic Hispanic congregations in the Midwest, if not the country. But now, the demographics are changing. Nevins attributes this change to several factors. He says some moved to warmer places as they got older. In other cases, immigrants returned home after struggling to find jobs or because the political climate has been shifting for immigrants in the United States. Those statistics and the future availability of priests are some of the driving forces behind the “Renew My Church” campaign sponsored by the Archdiocese of Chicago. Cardinal Blase Cupich discovered that in the next 10 to 15 years a large number of priests will be retiring, but an insufficient number of new ones will be available to take their place. As part of “Renew My Church,” each parish in the diocese is part of a grouping. Three to six churches in the same area will meet together to learn more about each other and then start to plan around some specific topics. “Renew My Church” is not a one-size-fits-all solution. Over the next five years, the goal is to have parishes plan and work better together. Nevins says currently each parish may provide religious education, social services, youth crime prevention, and other services. But because of a lack of resources, he says they sometimes must do things halfway. “How can we promote the mission of the church much better by sharing our resources, rather than everyone doing something on their own?” Nevins asks. While the “Renew My Church” campaign focuses on vocations, leadership (both lay and religious), and evangelization, Nevins says the common thread is promoting mission vitality that crosses parish lines and encompasses the entire archdiocese and the Catholic Church as a whole. “We are looking inside: What kind of treasures and pearls of great price do we have in parishes and how can we share that? How can we make the Gospel more alive for people and energize them to live their faith?” Nevins asks. In Chicago there is a connection between “Renew My Church” and the spiritual journey of Lent. During Lent, Catholics and other Christians are called to enter into a deeper relationship with the Lord. Some may participate in Lenten campaigns like CRS Rice Bowl, a program that calls Catholics to encounter Christ and our world through prayer, fasting and almsgiving. Walking down the street with Tom Boharic isn’t easy. The word “celebrity” comes to mind. Every few feet in Chicago’s Little Village neighborhood, people stop Tom to shake his hand or pull him aside for a quick word. They call out “Padre!” and he turns to answer their call. Boharic is unassuming, dressed in a winter coat, white collar and a ready smile. He is known in this community as Father Tom, an associate pastor at St. Agnes of Bohemia Church. He says it’s his job to know and care about the people who live here. Boharic says it’s easy for young people to get lost and trapped in a life of gangs or other dangerous activities. “There are many people being taken advantage of or living in fear,” he says. The goal is to offer opportunities to the youth who are most at risk. 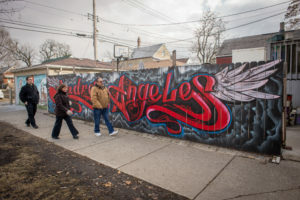 At St. Agnes, a program called Imago Dei combines arts intervention with gang prevention. 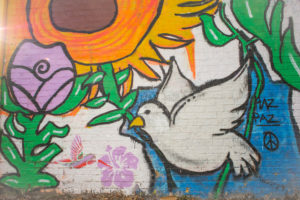 Because many young people in the predominantly Mexican immigrant neighborhood of Little Village enjoy art as a form of expression, Imago Dei celebrates authorized graffiti with colorful religious imagery and messages of peace. Boharic says it’s important for the church to recognize the unique gifts of young people all over the world, and then support the development of their talents. Like all priests who wear a collar, Boharic is a noticeable disciple of Jesus, but he is not the only one. He says each baptized person is called to serve. Diana Cervantes, Imago Dei director, and Oscar Contreras, facilitator, work with teens in the program. Boharic praises both, saying they have strengths he doesn’t and can reach the youth on a whole other level. Cervantes lost her 20-year-old brother to gang violence. The soft-spoken Contreras works closely with boys and young men in the program, in hopes of creating a connection between each individual and the Catholic Church. He also hopes their talents can be directed into good works. “There are so many gifts in our churches, but sometimes there is wasted talent,” Contreras says. Religious leaders struggle with how to encourage mentors to step forward and help guide these young kids. “How can we get our parishioners to say, ‘I want to do God’s work’?” he asks. One way recommended by Pope Francis, is participation in Lenten campaigns, promoted by many church organizations, including Catholic Relief Services (CRS), an agency that assists the poor and vulnerable here and overseas. One example of a Lenten campaign is the CRS Rice Bowl program, which calls on Christians to encounter Christ and the world through prayer, fasting and almsgiving. Pope Francis also reminds Christians to open doors to those in need and seek the face of Christ in every human being. He speaks about renewing our relationship with Christ and our neighbors no matter where they live. That’s also the quest at St. Agnes. 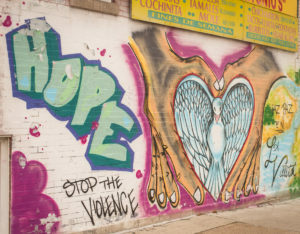 The Little Village community in Chicago is reaching at-risk youth through an arts-intervention, violence prevention program at St. Agnes of Bohemia. The Imago Dei program uses mentoring, art and faith to transform young people into agents of change. In this predominantly Mexican immigrant neighborhood, words of peace, religious imagery and colorful expression are everywhere. Doves, hearts, images of Mary with children, and trees represent renewal and unity. 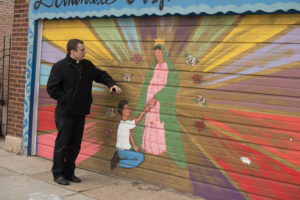 Though these street corners straddle gang boundaries, and their walls used to be littered with gang graffiti, today positive murals grace the city landscape thanks to a unique program supported by a neighborhood Catholic parish. Father Tom Boharic of St. Agnes of Bohemia Parish recalls how parishioners came to him, urging him to help find positive outlets for the young people of Little Village who are vulnerable to gang recruitment and other troubles. The Imago Dei program was soon born. “Even if young people don’t join a gang, many still have some connection to a gang because of someone they know — a family member or even where they live,” says Boharic, who joined the parish as a newly ordained priest in 2012. “Imago Dei” refers to the imprint God placed upon humanity, identifying people as His special creation, Boharic notes. Recognizing that presence in everyone can promote positive self-image and a sense of belonging. The parish found many young people were interested in art and the culture of graffiti — which often is not gang related or illegal. Over time, their work has become a community movement that values equity, fairness and progress in Little Village. The program is based on the belief that art inspires, encounters and empowers. Diana Cervantes is familiar with the challenges that youth in this area face; her 20-year-old brother Freddy died at the hands of a gang member in 2012. She says about 50 teens have taken part in Imago Dei since it launched in 2013. For many, these murals are their only form of expression and can be a cathartic experience. Imago Dei goes beyond a public arts project; it’s also a mentoring and faith-building program. Its goal is to continue fostering restorative justice and a peaceful, positive environment. Teens meet with Boharic and Oscar Contreras, the program facilitator, a few times a week. They get a meal, a chance to talk and an open mind. The parish has been recognized by the Archdiocese of Chicago and Cardinal Blase Cupich for using creativity, innovation and partnership in revitalizing the church and Little Village itself. “If these walls could speak: It’s like God speaking back to the young people, telling them how beautiful they are, showing them the art is a reflection on what is inside them,” Boharic says. The mural project in Little Village uses the power of art to overcome challenges and to look ahead. For many, Imago Dei represents renewal, investment, and a positive way to encounter the young people in the community. 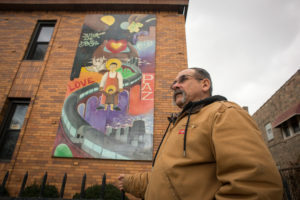 “It’s beautifying the community and spreading pride and love for where they live,” says Cervantes, who notes that no mural has been seriously vandalized. “There were many years of hopelessness, but now there’s hope. Children feel comfortable again playing outside,” she says. Imago Dei is partly funded by a Catholic Relief Services (CRS) Rice Bowl grant. CRS carries out the commitment of the Bishops of the United States to assist the poor and vulnerable. Read more global stories of hope.